​“I think this is the biggest IMTS to date…” Listen now! 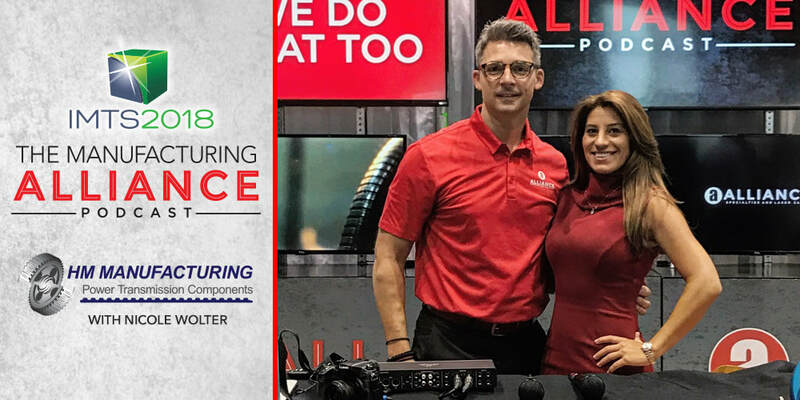 Tony Demikas with Alliance Manufacturing hosts President and CEO Nicole Wolter, live from IMTS 2018 in Chicago. Hear about the new innovations being showcased at IMTS, a shop owners opinions on the latest machines, the future of manufacturing and more! ​"We had the opportunity to speak with Nicole Wolter, CEO and President of HM Manufacturing, about JIT and MTO manufacturing and how her shop has implemented new technologies and softwares to reduce bottlenecks while maximizing output. These advances have given HM Manufacturing the opportunity to expand their operations." ​Enjoy watching President Nicole Wolter give a brief tour of our shop floor. Thank you to Tony Demakis from Alliance Specialties and Laser Sales for making it possible. Listen Now – Nicole Wolter is the President and CEO of HM Manufacturing with a background in engineering and finance. She has overseen the complete renovation of the company’s technology and engineering processes to become a 21st Century manufacturer. She is also dedicated to promoting STEM and manufacturing to future generations. Listen in as Lew and Tim discuss how Nicole got to where she is and the intrigue and excitement of being in manufacturing. Manufacturing – Crisis Strikes On The Shop Floor / Shift To Overdrive. Hello Metalworking Nation and greetings from our studio at the DMDII in Goose Island, Chicago. On this two part episode of MakingChips, we welcome back Nicole Wolter, President of HM Manufacturing Company. Nicole shares the captivating story of HM Manufacturing, a company that began with her father’s passion for F1 racing. The downturn of the economy in 2008 proved to be the perfect time for Nicole to enter the family business, but as she would come to find out, things weren’t quite what they seemed. Nicole’s questioning of all aspects of the family business led her to a startling discovery that would turn an already dire situation into a full blown crisis.In manufacturing news, we talk about how Summer camps could be the start for the next generation’s interest in the manufacturing industry. Ryan Scanlon with MakingChips, a weekly podcast that will equip leaders in the metalworking manufacturing industry, interivews Nicole with HM Manufacturing. 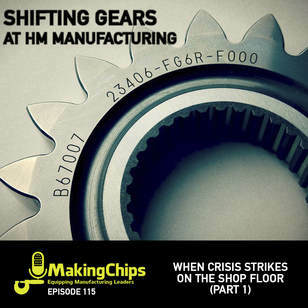 On this episode of MakingChips, we welcome Nicole Wolter, Vice-President of H.M. Manufacturing to the show. H.M. Manufacturing is a family-owned, gear and pulley manufacturing facility in Chicago that specializes in Custom/Standard Pulleys, Gears, Sheaves, Shafts and Pulley Stock. Today’s topics of discussion include Nicole’s rebranding of H.M. Manufacturing, ingenuity & innovation in machine technology, and shopping for the right machine tool.